Look. And look again. You might not see the same thing two times in a row. When I look at Bar Harbor in winter, I see a small New England town covered in snow (as it is today while I focus on this post). It has that Currier-and-Ives feel about it. In summer I see a bustling tourist town filled to the brim with strangers just milling around wondering what to do next, clogging the sidewalks and streets. There are days (when several cruise ships are in, for example) I wish I could hibernate like Taunton Bay horseshoe crabs for six months of the year—just dig a hole in the mud and retire from the scene for six months. Pretend the tourist season never happened. The irony being that shop and motel owners are blissfully happy on the very same days that I am down in the dumps. They are deeply invested in the economy of Bar Harbor, and that economy barely limps along in the winter, but runs full-steam-ahead from July through October while I think of hibernating. 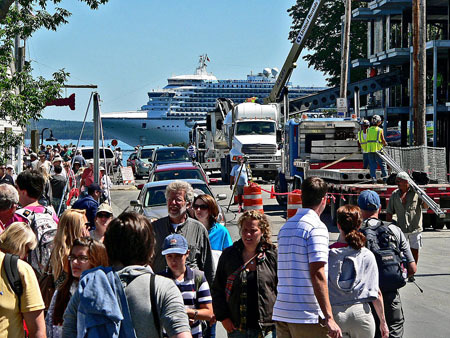 With a cruise ship in, the streets of Bar Harbor teem with summer visitors. That double-take is the result of the delta signal in my brain between good times and bad. At either extreme of happiness or deep disturbance, that is the signal that alerts consciousness to pay close attention to what’s going on because we’re sure to be affected one way or the other. If we had fair weather and smooth sailing every day of the year, we’d have no need for consciousness because we could just set the tiller and let the boat steer itself while we didn’t have a thought in our heads. But that isn’t how our little worlds work. We all have ups and downs, often several times a day. Depending on how we adapt to the situations we are in as they change for better or worse. Those situations aren’t the issue, it’s how we take them from our current perspective. Sometimes the very same situation sets us off in ways that are diametrically opposed. It depends on our mood at the time, what we had for lunch, how well we slept the previous night. As always, we’re in for the long haul, so slide from good times to bad, or the reverse a few minutes later. Just wait a bit and we’ll get over it. Or so it is to be hoped. Being mortal means we have earned the right to change our minds. To peer out through a new pair of eyes. I have winter and summer eyes to cast on Bar Harbor, which as a New England coastal community, is always doing its thing. I live here, so am along for the ride, whatever it brings. One thing for sure: tomorrow will be as different from today as Miami Beach is from Helsinki. 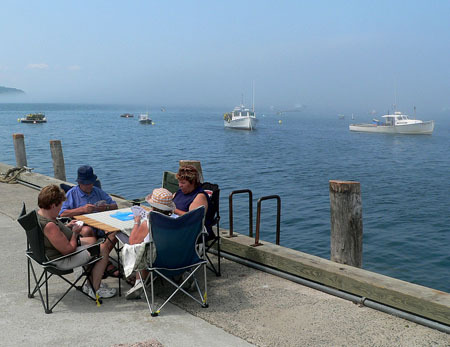 Card players don’t look up to enjoy the harbor. How we handle these dichotomies in experience is up to us, depending on how resilient we are. We can reach out with cheery spirits in an active manner to kindle engagements that might be lagging a bit. We can wave to friends and acquaintances instead of turning our backs. We can reach out to start an engagement, shake hands, pat them on the back or shoulder, share a hug, give a kiss, initiate a conversation, share a story, invite friends over for a game or for dinner. We each have a repertory of gestures that signal our readiness to engage. Nothing is more powerful than an open smile in inviting a trusting engagement. Eyes askance or to the ground signal otherwise. Even at work where we are expected to do our job, we can do it with a style that includes others in the process we are engaged in. If we seem to be enjoying ourselves, others will want to join in the fun. If we keep our head down, others will skirt our workplace by a good margin. By synchronizing our actions with those of others, we can make it easier to be ourselves in mutual companionship, even inducing them to join us. Such activities are moderated by our strengths and needs at the time, which we can subtly broadcast in our postures, gestures, facial expressions, and tones of voice. 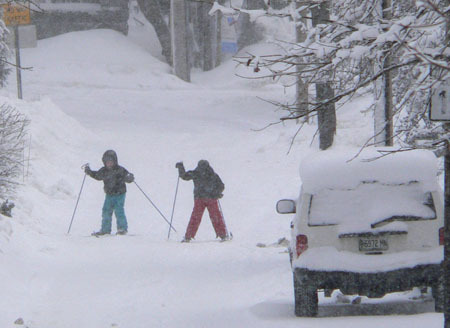 Body language on skis in wintertime Bar Harbor. In a very real sense, communities run on the collective body language of their members at different levels of intimacy. To make anything happen, we have to select the level we want to engage on, then show up and give it a try, always being mindful of the level appropriate to that occasion. The stuff that communities are built of is not bricks and mortar but flesh and blood. And something else: human minds. Each unique, each in a mood of its own. No two communities are the same because their prime constituents are highly specific. For that reason, it is dangerous to generalize about the nature of communities. With a different mix of unique inhabitants, each community is unique unto itself. Since communities are the warm seas that bathe our minds, we want them to harbor us as contentedly as we enjoy them. Harmony between a place and its residents is the watchword, even if seldom achieved. There it is again, that helical loop of hospitality and gratitude between a one-celled organism and its surroundings. We humans are no different in depending absolutely on the nurturing engagements we establish with the communal niches that provide for us. Every community is just such a niche in providing water, clean air, food, shelter, work, companionship, and much else. The polarity of the relationship we establish says it all: this is the good life, I like it, I approve, I want to stay here; in contrast with: this is the pits, I hate it, I disapprove, I can’t wait to get away. To get clear with ourselves, we intuitively react in such passionate terms. Our minds are made to sharpen distinctions in our minds so we think and feel in bold strokes. Our minds do the heavy shading for us so we won’t miss the point in a wash of subtle tones. Fish or cut bait, stay or move on, help or get lost. People pay good money to ride on roller-coasters to remind them they are alive in two different ways—up and down, good and bad. Being alive means having choices. Choices and decisions require backing consciousness with sound judgment. Whizzing us up and down, life is guaranteed to deliver just such a ride, testing our judgment on every hill and valley. Please note: I usually have second thoughts about hibernating for the duration of a summer in Bar Harbor. I may let the throng get me down at times, but I always bounce back and take to the woods for a walk, or Taunton Bay for a row. This year I’ve had thoughts of hibernating under all this snow. Just dig a hole next to my poppy bed and hunker down where the snow will serve as insulation from the chill blast out of Canada. It’s not that bad things never happen. Our paramount skill is in being resilient no matter what comes our way. That’s it for my posts on the topic of community. Now it’s on to the family level of our engagement with the world, which I will explore from my point of view in upcoming posts. This post is the last installment in a series about twelve of my engagements with the culture we put between ourselves and nature. 10. Space Junk. Early in 1962, I started work at Harvard College Observatory by setting up a photo lab that eventually expanded to become worthy of the Space Age. I started my fiefdom in a one-room darkroom with walls eight feet apart, which ultimately led to a fourteen-room photo lab suite near Fresh Pond on the outskirts of Cambridge. Apparently there was money for expansion available in those days. Early on I was handed a remnant from a fallen Russian satellite that had landed piecemeal in northern Canada. No one knew what its function was, but as a novel piece of space junk, it deserved to have its picture taken. That was a first for me, and the beginning of Harvard’s playing an active role, along with the Smithsonian Astrophysical Observatory, in lofting research satellites into orbit. With one click of my shutter, my mind went from a dark-wood kind of nineteenth-century awareness into a full-fledged, gold-plated, twentieth century engagement with the new world of space exploration and surveillance. 11. J.F.K. When President Kennedy was assassinated on November 22, 1963, I was in the photo lab darkroom at Harvard College Observatory making prints with the enlarger under the glow of a red safelight. I had the radio tuned to WGBH. When the bulletin came that Kennedy had been shot in Dallas, I called my assistant on the intercom and asked if he was listening to the radio. He was. The horror of that moment was implied in neither of us commenting on what was happening. Suddenly cut adrift from my everyday assumptions, I did what was familiar, so went on with what I knew how to do without thinking, my insides churning all the while. I never felt more cut off from the culture I lived in than I did contemplating that violent act in Dallas. Doubly sealed in my darkroom and in my own thoughts, bathed in red light, I got myself set to enter the new reality under the fluorescent lights beyond my lightproof darkroom door. 12. MIT Chapel. On a Wednesday afternoon in the spring of 1973, I drove my Humanities 3 class at Abbott Academy from Andover to Cambridge to see what we could discover in two hours exploring MIT. Starting on the steps of Building 10, we headed off in different directions to see what engagements we could have and sense we could make of a cultural institution devoted to science and engineering. A chapel had been added to the campus since my days at the school, so I was curious about what sort of building could acknowledge the ineffabilities of faith in those stark surroundings. On the outside it resembled a red brick pillbox much smaller than I thought it would be. Without windows, which surprised me. Entrance was through a curved archway. Passing into the interior, I left Cambridge, Mass., behind and entered another world. It was dark, almost black. I left my pupils to adjust at their own rate. Arcs of chairs spread across a circular floor. A larger space than I expected in a pillbox, almost infinite—like the darkness outdoors on a moonless night. Beautifully lit from above by a gentle shower of light descending from an off-center light tube onto a table below. Golden rectangles like leaves hung suspended in the glow as if falling through eternity. I was stunned by the aura of the place. I sat and savored the ambience. Everything faded except for those golden leaves. I had not a thought in my head. Unlike the granite institution on the far side of Mass. Ave., here was no place for thought. Awe, comfort, and wonder were the currency in this space. Whatever I needed at that moment, there it was. Released inside, not outside of my body. As my eyes adapted to the shadows, I sensed movement in front of me to the right of the table. I was not alone. A silent figure removing something from a case. Raising it up. Suddenly a burst of music. A violin. Bach. A solo sonata. The voice of that place on that day. Exactly what I needed to hear. What I had come for and didn’t know it. At MIT of all places. I just sat, wholly open to the dark, the music, the falling golden leaves. I knew exactly where I was, who I was. I was meant for this experience. Nothing else mattered. There was nothing else. After a time, the music stopped, the figure of a woman carrying a violin case passed up the aisle. Who could she be? Why had she begun playing in the dark after I sat down? But I already knew. She was kin. A fellow wayfarer. Making sense of her brief stay on Earth by doing what she had to do. As I had had to take my class on yet one last voyage of discovery before Abbott (oldest girls’ school in the U.S.) shut for good in a few weeks, to be swallowed by the boys’ school up the street, leaving me out of a job. What these twelve cultural engagements share in common is that I remember them from the years between 1951 and 1973, each having made its mark on my mind and memory so that it is still available to me today in 2015. Available, I now believe, because of an element of surprise in that things turned out other than I had expected them to. Each incident of engagement is based on a discrepancy between my expectancy on that occasion and what actually happened. The combination of discrepancy and surprise heightened the engagement itself, making it memorable, for either its positive or negative polarity in comparison to what I was ready for at the time. These incidents are the stuff of my personal consciousness. The emotionally-charged high points between long hours of my flying on automatic pilot, between routine engagements leading up to the peak occasions marked by disparities such as these. Why do I call myself a wayfarer? Because I love going beyond where I’ve been before. Exceeding my own expectations. For good or ill, trial-and-error is the name of my game. Taking the next step, and the step after that. Some would call it empiricism. Or experimentation. I call it being a wayfarer driven by heartfelt curiosity, and the conviction that wonders surely lie around the next bend in the trail. Now, onward to the community level of engagement. Our minds respond to the bite, the pang, the sting, the punch of disparity between the two sides of our engagements with culture. Between what we want to do and what we can actually pull off. We dream big so we can at least make some kind of mark. Habits and convictions are a drag. The secret is to pursue what we don’t understand. We can run on that fuel forever. The ocean of culture is always bigger than our little puddle of experience. There’s way more ahead than behind us. Surrender? Never! Keep looking over the next hill and around the next bend and down the back alley. We haven’t been there yet to discover those dimensions of ourselves. It’s easy to believe that culture is largely caught up with what’s wrong with the world, not what’s right. Just turn on the news. Read the paper. Talk with your neighbor. After a time it’s tempting to settle for that world of petty skirmishes and frustrations and disappointments and forlorn hopes. Bruised and battered, we want to give up. That seems the safest course. If we do nothing, nobody can blame us for doing the wrong thing. If we disengage and don’t venture a thing, we’ll be safe. Quick, hide! Quit the race, the forum, the stage, the soap box, the protest, the rebellion, the call to action. Don’t make waves. Go find a cave in the desert and cherish your lonely illusions. Blame the world for all that is wrong. You know who to name: Everyone but you. People are no damn good. If you’d never been born, you could have lived in ignorance forever. You had it made. Your big mistake was having doubts and asking too many questions. There are no questions in a cave. Only darkness. Forever. Just shut your eyes and ears—your black box is a kind of private cave. The ultimate shelter. Your own living grave. But no, disengagement is not the answer. Never the answer. This reflection is about engagement, not giving up. Not hiding, not taking drugs, not getting drunk, not running away, not quitting, not lashing out in anger, not blaming others. Engagement is aimed at using errors and discrepancies to change things for the better. The helmsman doesn’t blame his compass for getting off course; he has a wheel for correcting his heading. He’s not there to complain but to rectify that specific situation. He is a change agent, not a prophet of doom. As every cultural wayfarer is an agent of change. Every path leads both the right way and wrong way. It’s not the fork in the road that makes all the difference, it’s the change in your mind—your attitude, your dreams, your understanding, your growth—that matters. Where you are compared to where you want to go. You can get there from here. You are the voyager crossing unknown depths to new shores and continents, not for conquest, but for engagement, revelation, and discovery. As an Earthling, you claim nothing for God, King, or Queen. Your loyalty is to Earth and your own mind, your designated planet and vehicle of experience. It would be tiresome to run through all the dangers and failings of our cultural engagements. That would merely catalogue the norm of our fumblings through the ages. We could harp forever on the burning of witches and heretics, sinking of the Titanic, fiery crash of the Hindenburg, America’s so-called Iraq War, or the ruin of Middle-Eastern culture by sectarian strife and hostility. Killing others requires deadening oneself. I’m more interested in the opportunities suggested by the widening gap between the fullness of our promise and our meager accomplishments. There, now, is something to contemplate and engage to the fullest. A challenge worthy of us all.